Villa Italia near Dollywood and has Awesome Mountain Views with 4 bedrooms and 4 baths. This Smoky Mountain Cabin easily sleeps up to 14 people,... VIEW NOW. If you are looking for a fun and unique indoor activity to beat the heat this summer, check out the Gatlinburg Craftsmen’s Fair! This exciting arts and crafts fair features more than 180 of the finest craftspeople from all over the U.S. in what has been voted one of the most popular events in the South! Read on for everything you need to know about attending the Gatlinburg Craftsmen’s Fair during your summer vacation in the Smokies. The Gatlinburg Craftsmen’s Fair is a celebration of arts and crafts where you can meet local craftsmen and artists from around the nation! This is an exciting opportunity to watch these talented individuals as they demonstrate their skills. There will be all types of one-of-a-kind items for sale, including handcrafted jewelry, wood carvings, pottery creations and even homemade jams and jellies. This is the perfect chance to bring home something special from the Smoky Mountains that you just can’t find anywhere else! The event also features a Kid’s Corner, where your children will love creating sand art and painting projects that they can take home! If you enjoy live music, the Dennis Lee Band will be performing throughout the day with pop country hits, bluegrass tunes and nostalgic favorites! The Gatlinburg Craftsmen’s Fair takes place at the Gatlinburg Convention Center, which is conveniently located at traffic light #8 in downtown Gatlinburg. The event runs from Friday, July 13th to Sunday, July 22nd, and is open daily from 10 a.m. to 6 p.m. except for Sundays when it is open from 10 a.m. to 5 p.m. The live musical performances take place Mondays through Saturdays at 12 p.m., 2 p.m. and 4 p.m., and on Sundays at 12 p.m. and 4 p.m. The admission fee for the Gatlinburg Craftsmen’s Fair is just $7.00 for adults, while children 12 and under are admitted for free! The admission fee includes access to all of the craft booths, crafting for children in the Kids Corner and the live country, gospel and bluegrass music shows. This is one of the best bargains in the Smoky Mountains, so come on out for a wonderful event that the entire family will enjoy! Stay close to the Gatlinburg Craftsmen’s Fair with a summer vacation at Acorn Cabin Rentals! Our affordable cabins are just minutes from the Gatlinburg Convention Center and all of the attractions, shops and restaurants of downtown Gatlinburg! We offer a huge variety of cabins with up to 8 bedrooms, including a selection of pet-friendly cabin rentals where you can bring your furry companion along on the trip! While staying in our cabins, enjoy all types of fantastic amenities including fully equipped kitchens, bubbling hot tubs, theater rooms and more! Whether you are traveling as a couple, with a family or with a group of friends, you will love staying at Acorn Cabin Rentals! 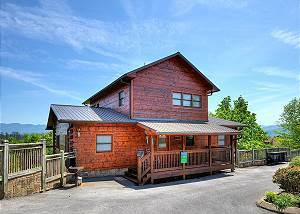 Check out all of our cabins in Gatlinburg today to plan your summer vacation near the Gatlinburg Craftsmen’s Fair! We look forward to seeing you soon at Acorn Cabin Rentals!